Nationally recognized for his research, Winship Cancer Institute's Dr. Suresh Ramalingam has developed individualized therapies for patients with small cell and non-small cell lung cancer. Suresh S. Ramalingam, MD, is certified by the American Board of Internal Medicine in Internal Medicine and Medical Oncology and is an active member of American Society of Clinical Oncology, the American Association for Cancer Research, and the International Association of Lung Cancer Study. Dr. Ramalingam plays an active role in the Eastern Cooperative Oncology Group as the Chair of the Thoracic Malignancies Committee and as the Deputy Chair for Therapeutics Program. Dr. Ramalingam serves on several international, national and Institutional Committees. He is currently a recipient of peer-reviewed grants from the National Cancer Institute. Dr. Ramalingam received his MB/BS from Kilpauk Medical College, University of Madras, Madras, India in 1992. He completed his residency in internal medicine at Wayne State University in 1996, where he was also named Chief Medical Resident in the Department of Internal Medicine in 1996. He completed his fellowship in hematology and medical oncology at the University of Pittsburgh Cancer Institute in 2002. 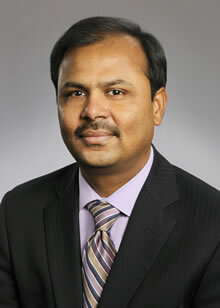 Dr. Ramalingam is the recipient of several awards, including the ‘James Eckman Award for Excellence in Teaching’, Department of Hematology and Medical Oncology, Emory University, and the Distinguished Cancer Scholar Award, Georgia Cancer Coalition. In addition, he is also a recipient of the ‘ASCO Career Development Award’ (2006-09). Dr. Ramalingam's research is currently involved in the development of agents that inhibit the mTOR, HDAC, DNA repair and EGFR pathways and in the evaluation of methods to individualize therapies to patients. He has conducted several early phase clinical trials with molecularly targeted agents in the treatment of small cell and non-small cell lung cancer. Dr. Ramalingam is published in leading journals such as the Journal of Clinical Oncology,Journal of the National Cancer Institute and Cancer. He is the Section Editor for Chest diseases for Cancer, the flagship journal of the American Cancer Society. He also serves on the editorial board of leading cancer journals such as Journal of Clinical Oncology, Annals of Oncology, Clinical Lung Cancer and Cancer, Chemotherapy and Pharmacology.